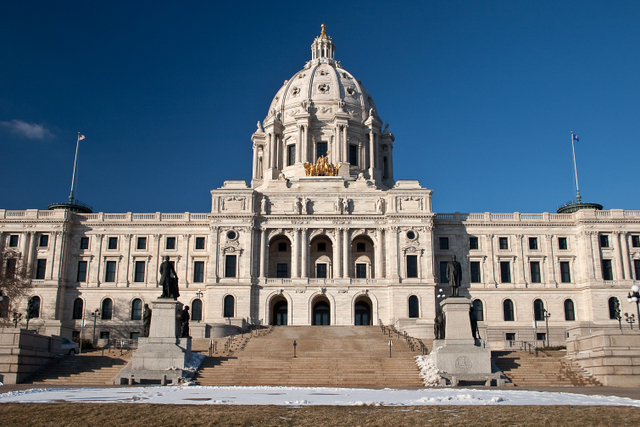 Minnesota approves 1.5 center adder for residential community solar subscribers — is it enough? Geronimo Energy celebrating another community solar install in Minnesota. Minnesota has cemented its status as the community solar state, but a design flaw in its program design has left many in the community as non-subscribers — namely, homeowners. Last week the Minnesota Public Utility took action to try and broaden the base, voting unanimously to approve an incentive to residential community solar garden customers of 1.5 cents per kilowatt-hour (kWh) for 2019 and 2020. Currently, residents make up about 81 percent of the 9,405 solar garden subscriptions but comprise only 10 percent of the gardens’ power subscription capacity. The commercial to residential ratio in community solar capacity distribution is around 9:1 right now, and this new incentive will certain make a dent, but solar advocates are questioning how much, having advocated for a 2.5 cent kicker. “This decision by the Minnesota Public Utilities Commission is a huge win for Minnesota residents that want to contribute to the growth of solar energy without having to install rooftop panels,” he said. “The previously thriving residential community solar market in Minnesota was dealt a strong setback by the value of solar (VOS) tariff when it was first introduced several years ago because the rate was lower than the old rates and only sufficient for the low cost of service of commercial customers. SunShare was instrumental in the PUC’s decision – its comment paper filed May 11, 2018 (for PUC Docket No. E-002/M-13-867) introduced significant data around how imperative the adder would be to the growth of the industry in MN for residential subscribers. You’ve probably heard, but more solar is being installed than ever before. As the cost of solar dropped the last decade, the economic case in areas of the country with high electricity prices was simple. This isn’t the case in the Midwest, where energy costs are lower, which keeps everyone mellower about the fossil fuels being mined and fracked in their backyards (we say this lovingly as Ohioans). So, sure, most of the action is on the coasts, but even the Midwest is now starting to emerge from its cave, rub the soot from its eyes and see (and harness) the light. Here’s what solar industry onlookers are buzzing about in the Heartland. 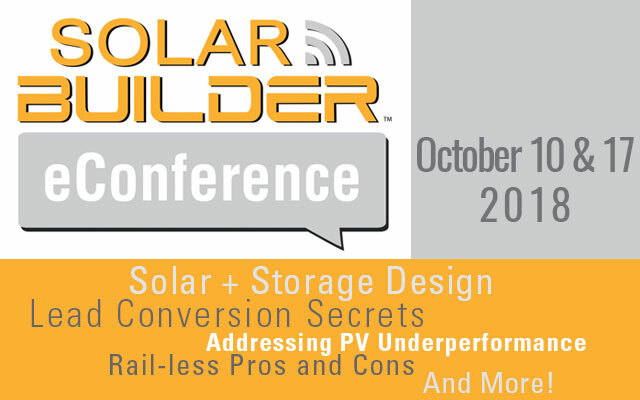 This article appears in the May/June issue of Solar Builder magazine. Subscribe here for FREE. Cheaper electricity and a less demanding public means the case for solar in the Midwest mostly starts with policy incentives, and with little public demand for action, the balance of political influence over the shape of those incentives is tipped a bit more to utilities and any other interested stake holders (legacy fossil fuel companies?). Utility-scale projects represent a little over half of the installations to date in those Midwestern states and about three quarters of the 2016 installations, according to data sent our way by GTM Research. The distributed generation markets in each state are all quite small still — sub 10 MW per state in each of the residential and non-residential markets for all of 2016. The latest legislative triumphs in the region all seem to support this trend too with renewable energy portfolio standards (RPS) being raised in Illinois and Michigan and unfrozen in Ohio (for now). The Illinois bill in particular was two years in the making and has solar developers excited. Illinois also allows for third-party ownership (leases or PPAs) of systems. Implementation of Illinois’ RPS bill is the top issue of SEIA’s Midwest Committee, which has been working with the Illinois Power Authority to “get the regulatory language that allows the intent of the bill to move forward,” says Sean Gallagher, VP of state affairs for SEIA. 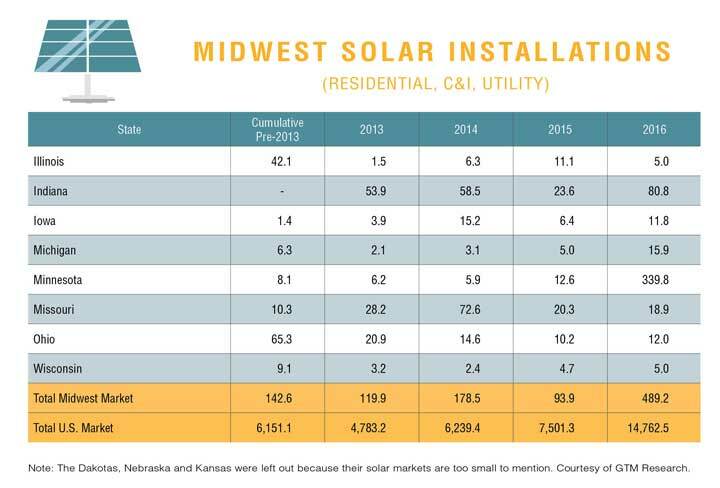 Perhaps the biggest exception to all of our Midwest generalizing so far is in Minnesota, where community solar has grown to become the third largest community solar market in the country after California and Massachusetts. We start in Indiana, which is ground zero for problematic energy legislation right now. The much-discussed SB 309 would phase out net metering in tiers: Early adopters would be able to keep net metering for 30 years; those who install between July 1 and 2022 can keep it for 15 years. Anyone installing after that date would be under the new rules. What are the proposed new rules? Essentially it would be a “buy all, sell all” arrangement where solar customers sell their power back to grid for the wholesale rate (~3 cents per kWh), and then buy it back at the retail rate (11 cents per kWh). 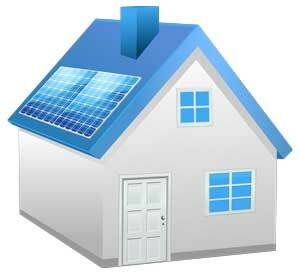 The carrot in the bill for the solar industry is that power purchase agreements (PPAs) would be made legal. UPDATE: That bill is no longer proposed — the Governor signed it into law. Arguably worse than the specific inhibitory policies is the general uncertainty lingering over much of the region. For example, we chatted with a developer based in New York who has been eyeing Ohio as a next great opportunity. Well, with the state passing a bill to freeze its RPS, which the governor vetoed, only to have a new, even more limiting bill be passed — how can anyone get a feel for how to proceed over the long term? Getting to this point was definitely not easy, and maturing the market from here will require even more work. Relaxed Trump-era carbon regulations might defibrillate the fossil fuel industries. Longer-term environmental and social arguments in general seem to carry far less weight than short-term costs, politically. Plus, Midwestern utilities have had the benefit of seeing net metered residential systems deployed on a large scale on the coasts, and some are trying to nip it on the bud. 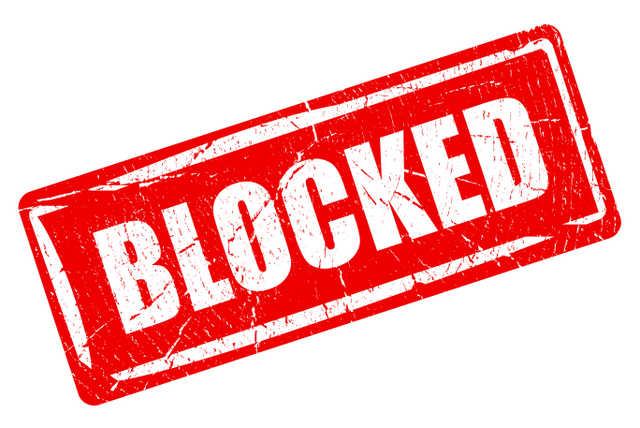 For example, ComEd tried to get a demand charge put into that aforementioned bill in Illinois, even though the net meter market in the state at the time was around 800 total customers. The Public Utilities Commission in Ohio is also considering proposals by several utilities in the state to double fixed rates for all customers. But despite it all, the momentum is real. SEIA and the Environmental Law and Policy Center (ELPC) formed a Midwest coalition about two years ago thinking there were opportunities on the horizon for new markets to develop. It was a baby step. 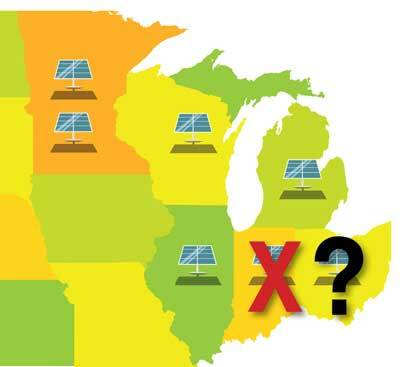 SEIA took a larger step this year and formed a Midwest Solar Committee. “We recognized that there’s been some activity toward the end of last year that’s starting to bring those potential new markets forward, which provides justification for SEIA and its members to devote more attention to those states,” Gallagher says. By the way, ComEd’s demand charge request didn’t make it into the final version of the bill. As we wrote about the lagging prospects of residential rooftop solar in the Midwest, Sunrun became the first large national residential rooftop solar company to expand into the Midwest, setting up shop in Wisconsin. Customers in Wisconsin can either own their system outright with Sunrun BrightBuy or own and finance it with Sunrun BrightAdvantage, using a loan arranged by Sunrun. “We see a demand for solar that has been underserved in the state and look forward to giving residents a choice to reduce their electric bills with solar, while providing value to the grid,” said Lynn Jurich, CEO of Sunrun. This highlights Sunrun’s ability to enter new markets in a low fixed-cost way through collaborating with local partners in the state. 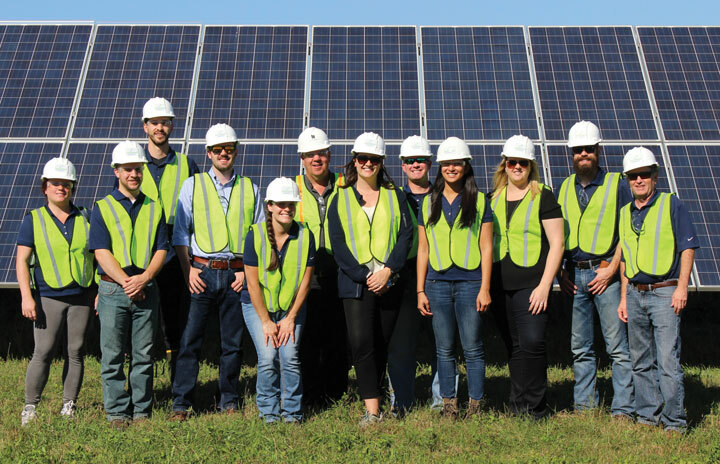 Sunrun’s economic investment is adding job opportunities in Wisconsin, and it is currently hiring for several positions for its solar team in Southeast Wisconsin. The state legislature of Minnesota passed a bill that sought to make state utilities exempt from regulation by the Public Utilities Commission. The purpose here was to get them out of the current net metering rates and be able to impose fees that would harm the residential solar industry in the state. Governor Mark Dayton vetoed this bill on Monday, maintaining the authority of the PUC in rate settlement and preserving the now maturing residential solar industry in the state. Passing a such a bill would seem odd considering the state’s leadership in the Midwest on the renewable energy front, including its recently announced goals for raising its RPS goals to 50 percent. Ten years ago, Minnesota Governor Tim Pawlenty and a bipartisan coalition of legislators enacted the Next Generation Energy Act. The landmark legislation passed with support from 97 percent of the Legislature – Democrats and Republicans. In the ensuing decade, the Next Generation Energy Act added about 15,000 clean energy jobs and contributed more than $1 billion in wages to the economy. But despite that progress, Minnesota will not meet its greenhouse gas emission reduction targets and create new energy jobs without additional action. • A proposed increase in Minnesota’s Renewable Energy Standard from 25 percent by 2025 to 50 percent by 2030. The increased goal will help Minnesota remain an energy leader and capture the health, environmental, and economic benefits of clean energy. • Clean energy jobs in Minnesota grew 78 percent between 2000 and 2014, growing steadily through the recession. In comparison, the state’s total employment growth was only 11 percent. Increasing Minnesota’s renewable standard to 50 percent would help continue this growth – creating an average of 1,500 new jobs annually in our state. If you look hard enough, you can see rugs being pulled out from under various things. Last week, the now Republican-heavy Minnesota House of Representatives passed a bill to cut the Made in Minnesota (MiM) initiative – a $15-million annual awards program that helped homeowners and businesses install solar panels. The program required that the parts and panels were built in Minnesota. Sounds cool to us, but the argument from the opposition that passed the bill was it was too much money for the state to dedicate to a program for the amount of jobs it created. What’s not cool? This move breaks a 20-year commitment between the State and Xcel Energy to provide alternative energy sources and leaves businesses that set up shop (and long-term business plans) based on the promise of this initiative in the lurch. According to the Solar Foundation, MiM created 495 jobs since 2013, with an additional 1,485 new jobs expected by 2023. Additionally, the Minnesota Department of Commerce reports that over 100 small businesses in Minnesota are involved in solar manufacturing, sales, distribution and installation. The Minnesota House also passed a bill Thursday to give Xcel Energy a head start on building a new natural gas power plant.